The Corps’ new leadership development initiative will take a fresh look at mentoring as part of a wider effort that will allow leaders more time to get to know their junior Marines, as the service continues its fight against bad behavior in the ranks. It’s coined Leadership Development, and it will introduce a new brand of more engaged leadership that might remind Marines of what they experienced at boot camp. From values-based discussions on the rifle ranges to more one-on-one mentoring, the initiative is aimed at reminding Marines that their values and behavior shouldn’t change when they hang up their uniform for the day. That concept applies particularly to younger groups, like lance corporals, the Corps’ most populous rank, many of whom are deeply skeptical of authority — if not outright disdainful towards it. Marines can expect more one-on-one discussions between noncommissioned officers and their junior Marines, as well as small group discussions. Just as leaders allow time for unit physical training or professional military education, they’ll now have time for leadership development. The commanding general of 3rd Marine Aircraft Wing launched his own program called the Committed and Engaged Leadership Initiative, and officials say it’s a good example of what’s to come for all Marines. Maj. Gen. Steven Busby has toured his wing and asked Marines to tell him what’s on their minds — and he listens. When a corporal and sergeant had the idea to build an obstacle course aboard their base, he invited them to break ground on it just days later. He has also invited lance corporals, corporals and sergeants to his home for breakfast or lunch to talk about the future of the Corps. 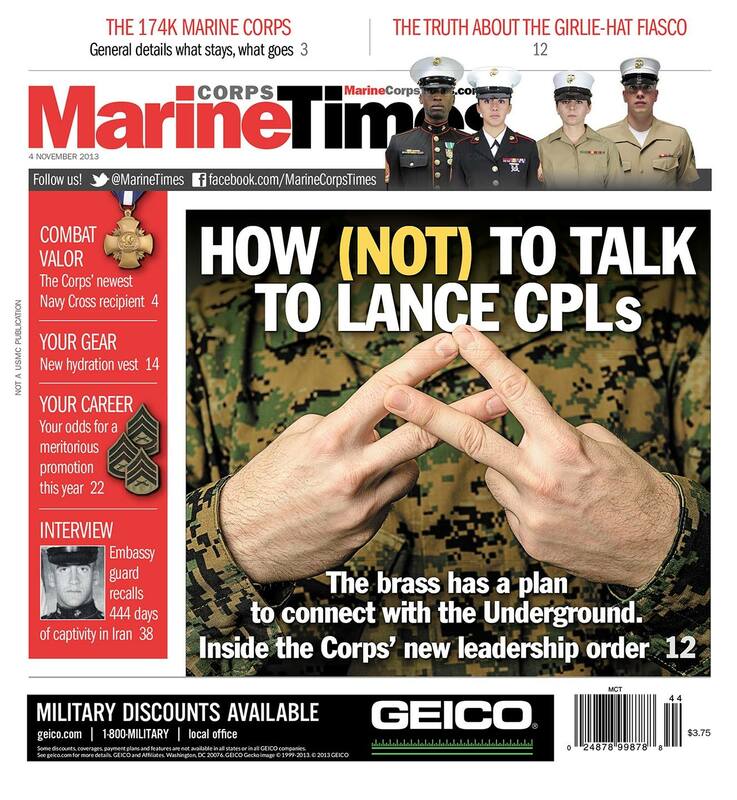 Pick up this week’s copy of Marine Corps Times for more on the Leadership Development initiative, or read the story on our Prime site here. Also in this week’s issue: a two-star general details what would stay and what would go if the Corps draws down to 174,000 Marines, a look at your odds for meritorious promotion this year, and an interview with a Marine security guard who was held for 444 days during the Iranian hostage crisis in 1979. Start your mentor initiative by having leaders worthy of respect. Noriega makes good points – there is a lot of “hanging it up” that goes on once soldiers make rank. When they are young, they say “I’ll never be that kind of NCO.” And then somehow, they always do (with many exceptions of course). Engaged leadership over time is hard. It takes real discipline and desire. Once someone has lost that drive, it’s hard to get it back. I too agree with the points made by Noriega. Additionally, all the NCOs that would have been exceptional SNCOs usually leave the Corps because they don’t want to deal with the BS either. Maybe this program will also help remind SNCOs about their values and leadership responsibilities. Hopefully they also begin to emphasize higher education in the civilian context for junior Marines. Not every Marine is going to do the full 20, so showing that LCpl that you are invested in his/ her overall success and development both in and outside the Corps would not only be beneficial to the Corps, but would also assist in gaining the trust and respect of your junior enlisted. Gentlemen- CONCUR wholeheartedly. The leadership need to set the example and lead from the front. If they cannot, they need to get out of the way and when I say that, I mean, someone needs to acknowledge that they are not leading from the front and take away their rank. No matter what, the leadership should always be out front. PT, Inspections, Weigh-in’s, etc. Junior Marines need to see that no matter what, good or bad, that thier leadership is standing right there with them. If they are working late, the leadership is there with them. If they are receiving an award, their leadership is there with them, if they are being NJP’d, their leadership is there with them as well. Marines need to know that we, as the leadership, are approachable and that we genuinely care. We are human beings just like they are. There is no difference. The only difference between us and the junior Marine, is that we, stepped up, pinned on more rank and as such, are responsible for more. We are not “entitled” to more. The only privilege we gain with rank is the privilege to lead. There is no greater privilege in the Marine Corps than to lead and have Marines counting on you no matter what. If you are not the example and fail your Marine in any way, you have lost them. All it takes is one time for them to lose the confidence they had in you. Our jobs as leaders in garrison, is to take care of our Marines as if we were taking care of them in combat. Would we not take care of them out there? Would we fail them out there? Would we hide in the rear and not lead from the front out there? I dont think so….